It’s the driver swap that could tarnish the legacy of a four-time world champion. Charles Leclerc’s arrival at Ferrari for the 2019 season puts Sebastian Vettel under the kind of pressure he hasn’t had in five years. Namely, a young teammate with the potential to put the German in the shade. And if Leclerc, the 21-year-old wonderkid from Monaco, gets the better of Vettel, history tells us the German won’t take it well. In 2014, Vettel was up against another rising star when Australia’s Daniel Ricciardo joined Red Bull, alongside the man who had won four consecutive world titles. Ricciardo won three grands prix, while for Vettel, it’s the only full season of his career where he hasn’t won a race. Morever, Ricciardo comprehensively outscored Vettel in the championship, 238 points to 167. Before the end of the year, Vettel had sought refuge elsewhere, signing for Ferrari. Asked by Wide World of Sports for his thoughts on the potential for fireworks at Ferrari this year, Ricciardo admitted it could provide fascinating viewing. “Yeah, it’s going to be interesting,” Ricciardo said. Ricciardo’s last point is the most telling. 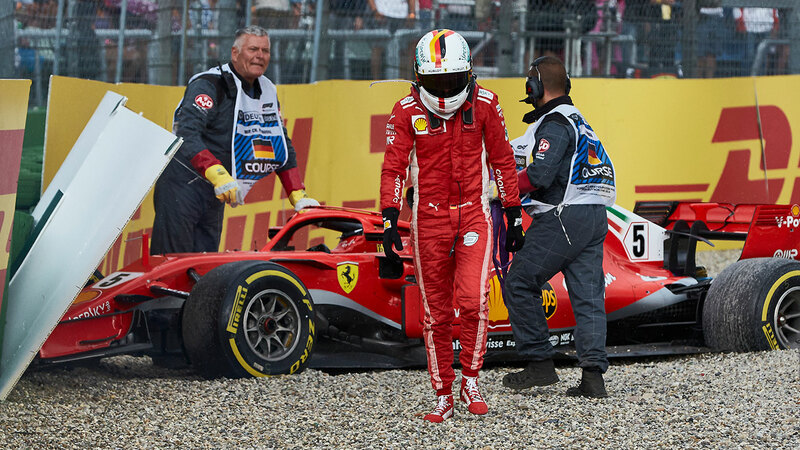 Vettel has a history of making errors when under pressure. He all but gifted Lewis Hamilton the 2018 world title with a series of mistakes, and some will tell you the 2017 championship as well. Many of Vettel’s race wins, especially in the Red Bull era, came from taking pole position and dominating the race from the start, building up a sizeable lead and controlling proceedings. His move to Ferrari in 2015 brought him relief from the pressures of a teammate who could consistently challenge him. Kimi Raikkonen was a former world champion, but in the latter stages of his career and usually that critical fraction of a second slower than the German. Raikkonen’s departure, and the arrival of Leclerc, changes that dynamic completely. Leclerc is tipped as a future world champion. He won the GP3 title in 2016 and the Formula Two championship in 2017, before graduating to Formula One in 2018. He outscored his Sauber teammate Marcus Ericsson by 39-9 in the championship last year, confirming his status as a star in the making. In September, Ferrari confirmed Leclerc would replace Raikkonen in 2019. And if Leclerc gets the better of Vettel in 2019, where does that leave Vettel, who turns 32 midway through the season? Would he play second fiddle to Leclerc, in much the same way Raikkonen supported him for four years? Unlikely. Would he want to rejoin Red Bull, even if there’s a vacancy, and go head-to-head with Max Verstappen? Unlikely. Would he want to join Lewis Hamilton at Mercedes? Unlikely. It’s why 2019 is shaping as a critical year for Vettel. Get the better of Leclerc, and he still has a shot at a fifth world title and Ferrari’s first since 2007. But if Leclerc has the upper hand, Vettel’s career could be on the same slippery slope as Raikkonen’s, who this season will be trundling around in the midfield with Alfa Romeo. But according to Ricciardo, it’s a challenge Vettel won’t take lightly. Winning a championship for Ferrari is perhaps the ultimate in Formula One. Some of the greats have won a title for the Prancing Horse: Schumacher, Lauda, Fangio and Ascari spring immediately to mind. The coming season will tell us whether Vettel’s name can ever be added to that elite list.